← Check out the New CALI Website! Webinars available. What the Heck is CALI??? Greetings to new and returning law students and faculty! I know this month is filled with new, exciting (and maybe even scary) changes. It’s also filled with INFORMATION OVERLOAD. In case you missed it, hopefully in your orientation materials there was either a cellophane pack of “Time Trial” cards with a code card facing out or just a single business card with CALI on it. These are very important! Why? 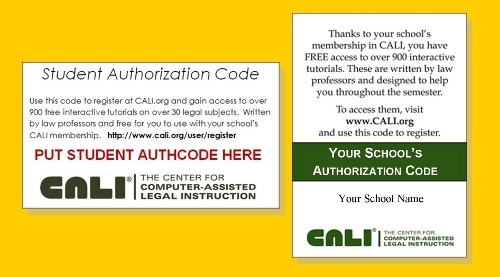 Because they contain the Authorization Code you need to register for CALI and get access to over 900 FREE interactive lessons on a wide variety of law school course topics. CALI Lessons are a great tool to help you supplement your course readings and test yourself on your comprehension. 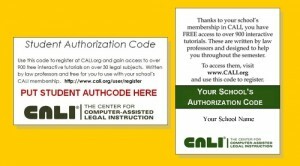 And did we mention that they are absolutely free for you to use thanks to your school’s membership in CALI? And that you can pick which lesson to take via our Casebook Correlation charts? So you’re probably thinking to yourself, “Okay, CALI, I’m in. How do I register?” Excellent! Registration is very easy and should take about 2 minutes. 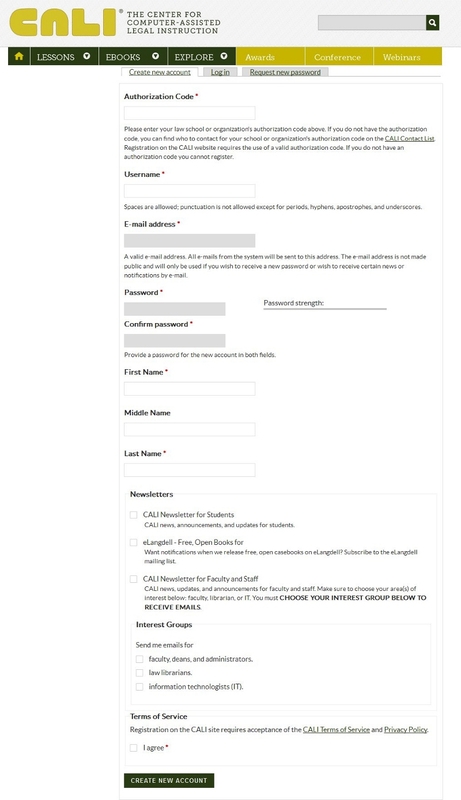 Before you get started you need two things: (1) Your school’s authorization code and (2) an email address. Yep, that’s it! Okay, to start you will go to www.cali.org. In the top right hand side of the page, there is a link to register. (Shown below.) Click that or alternatively you can just go right to www.cali.org/register. (1) Make sure your authorization code is accepted by the site. You’ll know it is when you are asked to pick a graduating class date. You may have to click outside of the box to get the process started. It usually takes just a few seconds, but during the back to school rush, sometimes it may take up to a minute. (2) Use a valid email address. We generally don’t email students unless it is a site maintenance emergency, but if you forget your password, the system sends out an email for you to reset it. That’s pretty much it. 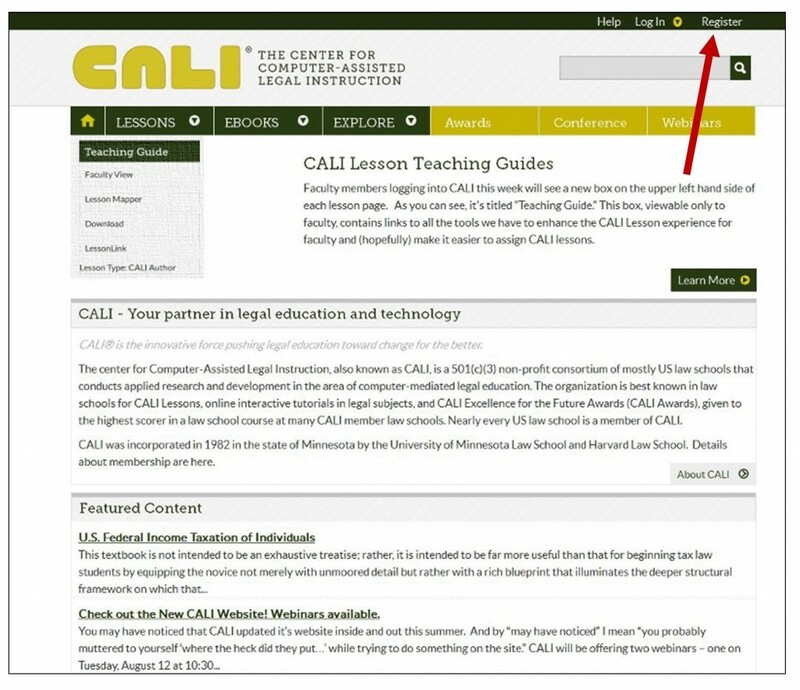 Register once and then for the rest of your law school career you can use CALI lessons as often as you like. If you have any questions or issues, please don’t hesitate to contact us! We are here to help you get through law school. This entry was posted in CALI Spotlight, CALI Tools, For Faculty, For Students, Lessons. Bookmark the permalink.